August 2012 – run baizel, run! Just learned they’ll be posting splits from my race. The action starts at 8 a.m. PST and the site is http://www.headlands50k.com/splits2012.php I hope to finish in the top 100! Interesting and somewhat unconventional ways of powering through uphills and balancing yourself on the downhills, and even how to use your arms when turning. I think these are especially helpful suggestions when you’re blazing as fast as he is, but still hopefully helpful to the rest of us common folk. Gu Gel, Gu Chomps, Gu Brew. Hammer Gels, Hammer Perpetuem, Hammer Heed. Stinger Gels, Stinger Chews. And on and on. There is no shortage of products for pre-, during, and post- endurance activity. I’ve found the Gu gels to be great during a long run as well as a Bonk Bar for runs over two hours, eating one an hour. And Nuun tablets in my water for my electrolytes. But all of that can get old and I can’t imagine eating Gu gels by the handful during every long run I do from here on out. So I went out on a research mission to see how I can make my own long run food. I learned about these from reading Born To Run where it talks about how the Tarahumara solely use them during their long jaunts. Chia seeds are the new quinoa, which is soooo 2006 now. 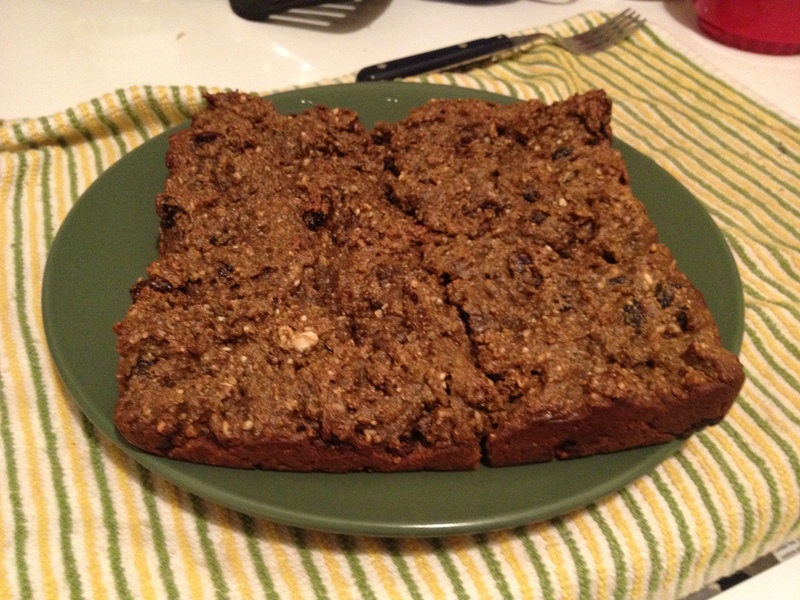 For whatever reason there were not many recipes using pinole and chia in an energy bar. Finally I found one and this is the one I tried out. Update: I tasted them this morning as I was wrapping them up individually and the taste is spot on. The dried cherries definitely come through. I’m taking them on a run this weekend so we’ll see how they do there. This past weekend a handful of our bada$$ team ran the Skyline 50k. For several of them it was their first ultramarathon (and marathon!). I decided to do my weekend long run along the same course in the hopes I could run with a couple of them. One teammate in particular I joined around mile 23. She had just started walking a short while before as her right leg had tightened up big time. We tried several things to try and loosen it up – her pounding it with her fist or me driving my elbow into it – but nothing seemed to help. So we walked together, trying to run every so often. But it was soon clear that she would have to walk the rest of the race. I found a couple of solid walking sticks along the way and that’s how we made it in the last 8 miles. I saw every range of emotion under the sun while I walked with her but I never once heard her mention the word ‘quit’. I saw her cry, saw her laugh at her frustration and pound her walking stick into the ground and also simply casually carry on a conversation. Slowly but surely we knocked out mile after mile, including two long uphills that seemed to never end. She rocked it and finished within the allotted cutoff time. I hope I can find half the grit she had when I run my race in two weeks. It’s gonna be gut check time! I recently switched from Brooks Adrenaline GSRs to the minimal New Balance MT110. It’s not an understatement to say it has been a *huge*upgrade. I had been battling severe hip and knee soreness and pain all season whenever I went over 5+ miles. Fresh off a 28 mile run. Hold your nose. I foam rolled, stretched, got my yoga on, went to an Active Release Therapist, iced down after my long runs. Although the pain would subside some runs, especially after an ART session, inevitably the pain would come back on the next long run. With my old shoes, after one run in particular I literally could not walk when I finished and was back at my car. But as soon as I removed my shoes I was able to walk, barefoot. That’s when the light went on for me and I figured the shoes may be part of the problem. I researched seemingly every trail shoe out there and found myself being drawn to the minimal shoes. In ‘Born to Run’ Christopher McDougal makes a very compelling argument against thick soled, well supported and cushioned running shoes and how they limit the foot’s ability to absorb the impact of running, in turn transferring the shock to other parts of the body. I’m summarizing here but that’s the gist of it. 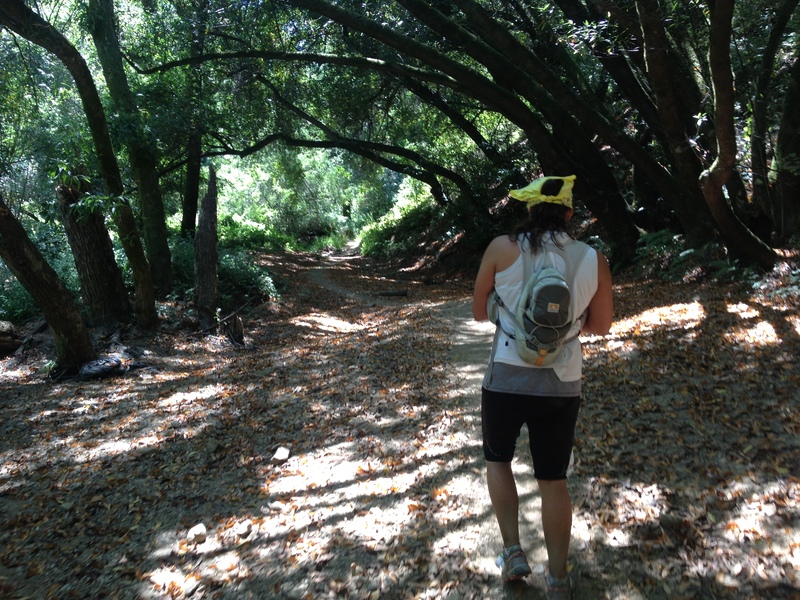 I christened the MT110 with a 12 mile run with elevation on the Miwok Trail and they felt great. The knee pain started creeping back in towards the end of the run but I’d say it was about 25% intensity of what it usually had been. Two weeks later I took them on a 28 mile run. The first 20 miles felt fine, no knee or hip problems at all and this was with lots of climbing and downhills. My knee started acting up around mile 24 (5 hours) which is much longer than I had gone without pain in my Brooks. All that stuff aside, these shoes are FUN. They’re super light (7 oz versus 12 oz), I wear them barefoot (I coat my feet in Vaseline and no blisters yet) and I feel faster in them. I also feel more stable on the trails. I’ve worn Brooks Adrenaline road shoes since 2004 and they’ve been great but I think this minimal thing is the way for me going forward. As you’ll hear everyone say, you should take your time adjusting to minimal shoes. I’ve worn the NB Minimus to work everyday for the past 3 months and that’s helped my achilles adjust to the reduced heel. 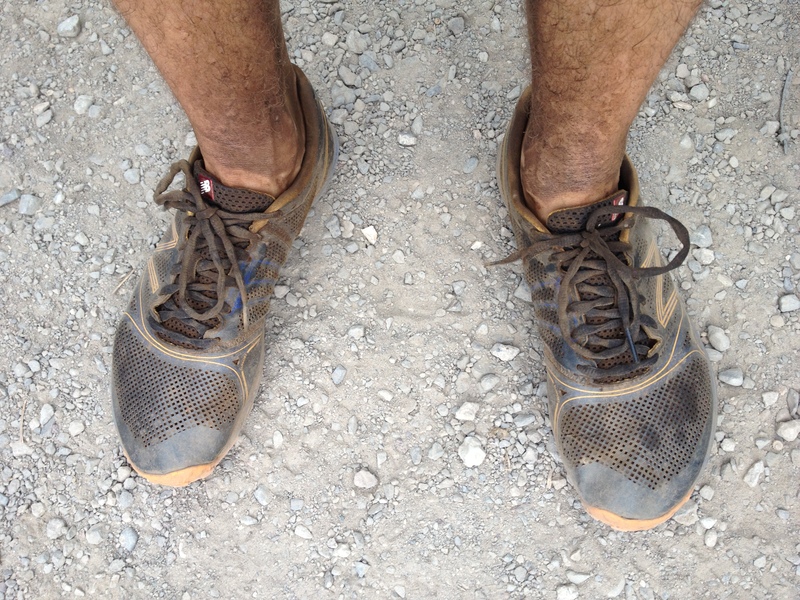 One downside of running barefoot in the MT110 is the shoe smells incredibly awful. I can smell them while I’m running. NB added an anti-odor feature to the Minimus but for some reason did not do the same with the MT110. I can live with that though!